The holdfast is a tool that has historically been around for a very long time, but until the late 70’s/early 80’s (if not later) it had fallen off the scope of all but the most devout hand tool woodworker. Luckily, the resurgence of hand tools has helped to bring about this wonderful version from Lie-Nielsen. The Lie-Nielsen holdfast is made out of Cast Ductile Iron which creates a very sturdy tool with enough spring to flex properly in order to either hold your project solidly or retain a batten. The latter is very useful if you are concerned about the risk of any possible compression damage to your work. Each holdfast is 13” long, has a reach of 7.25” and weighs in at 2.15 Ibs. The holdfast has a beautiful hot oil finish and a nice textured surface. The underside of the contact patch on the holdfast is ground to assure proper contact. The holdfast’s shank fits into ¾” diameter holes through your bench, and will hold securely in tops (or legs) of up to 4” thickness. If the top or leg of your bench is thicker than 4”, you may need to relieve a portion of bottom/rearward section to 1” diameter, to obtain a solid hold. While I’m certain that many readers have seen a holdfast in use, I want to make sure I leave no one in the dark. 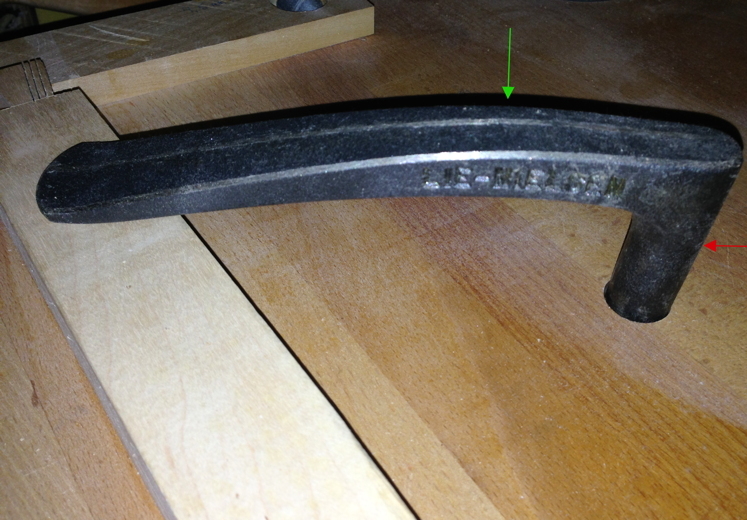 To utilize a holdfast, the shank is placed into a ¾” diameter through-hole and a mallet or hammer is used to strike the top of the holdfast (green arrow in photo below) to seat it. 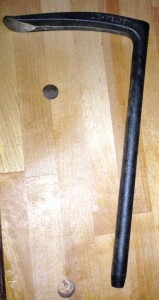 I’ve used a large wooden mallet and a very small lightweight hammer and both were quite successful seating the holdfast. I have a small flap of leather I glued onto the striking face of my small hammer, so I don’t ding my holdfast, but that’s really just a personal thing. To determine if the holdfast is actually holding securely, just grab it by the head and see if you can move it. If the holdfast doesn’t move, it’s performing properly and nothing more is required until you want/need to move it or remove it. To loosen the holdfast you strike the end of the head (red arrow in photo below), from the shank side, with your hammer/mallet swinging parallel to the bench. It can take a few strikes to loosen it, so don’t worry if the first hit doesn’t loosen the holdfast. Their ability to handle some jostling, and to retain their grip, is why they work so well in woodworking. While there have been a number of holdfast designs over the ages, Lie-Nielsen’s design seems to make the most sense to me. 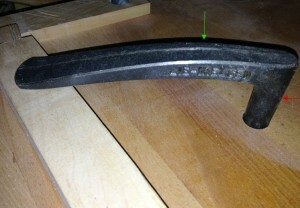 I’ve used other holdfasts that either had a large arc in it’s shape and/or the front section was very pointed in shape. Lie-Nielsen’s has a very low profile on the bench and the front end is fairly blunt. This may not seem as if it would make any real difference, but when you are working on your project, you might be surprised how your hands or parts of planes/tools want the same space as some holdfasts. The somewhat pointed ends on some holdfasts can certainly remind us of sloppy technique or at least spacial awareness, even without causing bleeding. Obviously, in order to use a holdfast, you will need to add some ¾” diameter holes in your workbench, assuming it doesn’t already look like a pegboard. I find it useful to take a little time to think about the types of work in which you intend to utilize the holdfasts, prior to drilling a hole, laying the holdfast on the bench to help find the prime locations. This would apply to both the benchtop and the front leg opposite of the front vise, if the leg is flush with the front edge of the top and you wish to restrain the rear section of boards, while holding the front portion in your vise. This assessment should help to limit any time wasted on unnecessary holes, while retaining the maximum strength in your bench. I drilled the holes in my benchtop with a quality ¾” forstner bit and it required an extension to finalize the depth of cut. Just take your time and let the bit feed, clearing regularly, and make sure you use a drill that’s up to the task. A square or two (for both planes) is also useful if you have any trouble drilling vertical, as this size bit can grab fairly ferociously if you lose your focus and let the angle wander. I use my holdfasts (yes, I have a couple, to cover all contingencies) to hold boards on which I’ve already cut the tails and pins for dovetails, while I chisel out the waste wood. I always make sure to have a thin scrap piece of wood to which I’ve applied a thin piece of leather to the side that will touch my project. I use this to prevent any marring or inadvertent damage from the force of the holdfast. I also regularly utilize my holdfasts when I’m planing the face of a board on my bench. I have a stop I installed on the left end of my bench, which I plane against without clamping the work between dogs. There are times where the contact of the stop is insufficient to prevent the wood from shifting or spinning around, even though the stop stretches about 8” across my benchtop. When this happens I’ll use my holdfast to hold a wood scrap, thinner than my workpiece, at either a right-angle to the workpiece, or parallel to it, depending on what works best. There are a multitude of uses for a holdfast, of which I’ve just scratched the surface, but hopefully this will provide you with a starting point and you’ll let your imagination run wild. I hope you enjoyed the article and please let me know if you have any questions or comments. You discuss the maximum thickness of workbench to use the holdfast. What is the minimum thickness recommended to make the holdfast successful and useful? Great article, but how do you loosen the holdfast when done or did I miss that part? Connell, that’s a good question. Since the pad under the front of the holdfast is at a small angle compared to the shaft of the holdfast, when struck from the top the holdfast near the shaft, the gripping leg flexes slightly and it’s that spring force that keeps both the holdfast and workpiece in place. As long as your bench top is rigid, I wouldn’t expect the minimum factor to be much of an issue. The one minor caveat is how the spring force can potentially create some denting towards the underside of the bench, especially in tops made of softer woods that are also thin, and this denting can gradually create less grip. If you have this type of an issue, adding on a piece of wood to the underside of the top, increasing the thickness out from the holdfast holes, might limit this issue. Obviously, the additional wood would need to be very solidly attached, with the forces involved. Thanks for your question. Good luck with this. I’m glad you enjoyed the article. Each of the Lie-Nielsen holdfasts is currently $50. Good to hear you’ve been successful and seemingly enjoyed your tool. I find it useful to have a range of options available, to cover all of my bases. Thank very much for the article on the Hold fast . I purchased mine from Gramercy tools N .Y. C. the hold fast is terrific. I have two of them . Your absolutely correct in what you stated in this article. I had to relieve my holds from the bottom of my work bench with a taper ed drill bit about 3/4 inch which changed the bench holes to 4 inch deep . thanks .